Hickies shoelaces are no tie elastic shoelaces. I was sent two packages of the shoe laces to review them on this blog. No monetary compensation was received. 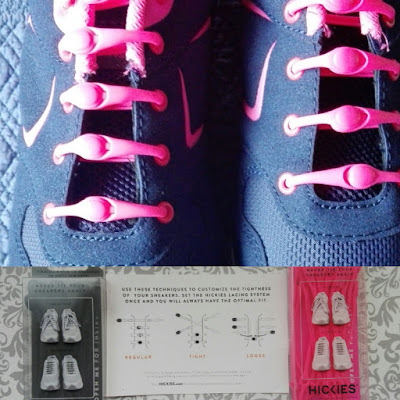 I received a hot pink pair that I have already put in a pair of my daughter's shoes and a black pair that will go into my son's shoes once we buy a new pair. The kids think these look really neat compare two laces that crisscross. I did the leasing for these and didn't think they'd take any longer or shorter amount of time then using other shoe laces. but because these are a plastic elastic type of shoelace they will stretch when you stick your foot inside of it. If it is too tight to stick your foot in at the top you can undo the lace and reattach it around the hard clasp. They also come with a card that shows you three ways you can lace them. The way I have them placed as for a regular fit but they also give you options to lace them if you want a tight or a loose fit. My readers can get a 20% off by using code USFG to save. These are a great gift for the holidays and would make a perfect stocking stuffer.